A local TSA worker at Meadows Field Airport shares how she is being impacted by the ongoing government shutdown. BAKERSFIELD, CA. — Nicole Cancio is bracing for her second missed paycheck as a TSA worker at Meadows Field Airport. She is among tens of thousands of federal employees working without pay during the longest government shutdown in American history. Cancio said she typically lives paycheck to paycheck. Because she is working without pay, Cancio said she is now forced to get help from her parents. It is unclear when Cancio will get her next paycheck. 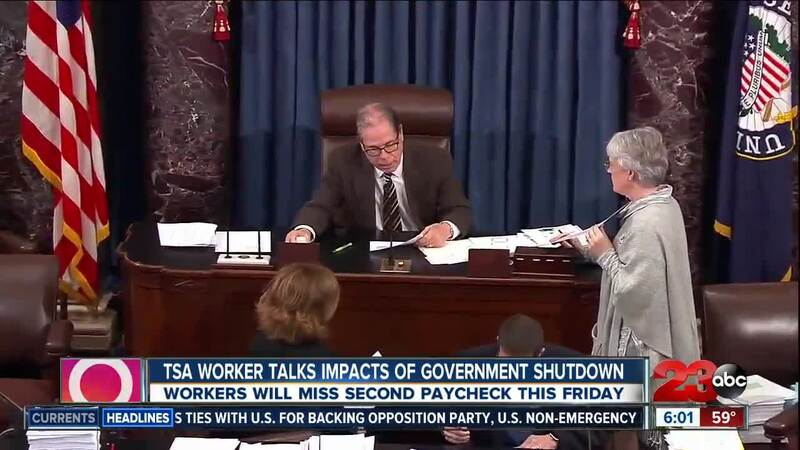 Two competing Senate Bills aimed at ending the shutdown failed Thursday January, 24. Both sides of the aisle are refusing to back down on border wall funding. The showdown between President Donald Trump and Speaker of House Nancy Pelosi intensified after Pelosi blocked the President from delivering his State of the Union Address in the House Chamber. That uncertainty in Washington is spilling over into Kern County. "I am really considering moving back in with my parents or I could get a high interest loan. My options are limited," Cancio said.